We would like to introduce recent news & changes in the application. The last two months were mainly focused on the upcoming GDPR legislation, Emails, Experiments and the new feature – Predictive Campaigns. Exponea offers you whole GDPR & security application package. With the right approach and settings, we help you to be GDPR compliant. Find more information about specific functionalities in links below. Our certified consultants provide specific GDPR guidance to aid in becoming compliant. If you are interested in this guidance, please contact our support(support@exponea.com). 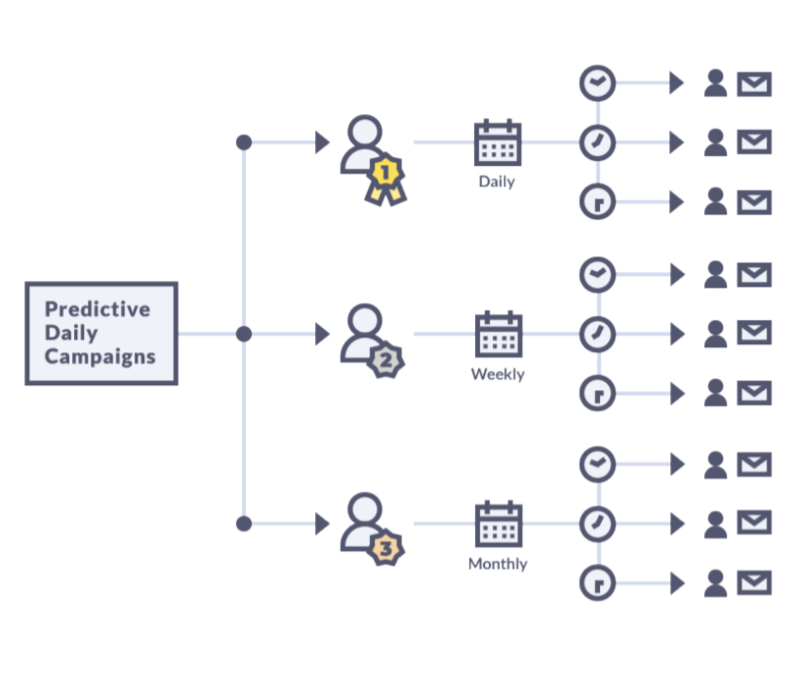 Predictive Daily Campaigns is an advanced feature powered by prediction models, enabling you to optimize your email marketing campaigns. Let Exponea introduce AI and a high level of automation to your email marketing – predictions will define the right audience and time and advanced analytics capabilities will help you determine the most relevant content. Predictive Campaigns is a very difficult topic to understand. If you would like support, our team at support@exponea.com can provide you with more detailed information. Many marketers use emails as the primary communication channel. Customers open emails on various devices. Your goal as a marketer is to ensure that the majority of emails look as required. Email Preview enables you to check the final look of your emails on more than 80 different email platforms and devices. Analyze your customers – find out the most used email platforms and optimize emails for them. Email preview can be found in every email node under the Test tab. Regular email campaigns (e.g. acquisition, retention, etc) are sent to many users at once. When we are talking about medium size businesses, the volume of emails may easily climb into the thousands. Such email campaigns can cause some of the email providers will mark your emails as spam or will not even process them at all. This has an impact on the delivery rate and eventually, it may influence your revenue. The bulk settings are a one-click configuration that will automatically mark the bulk email with the proper information, therefore there is a higher chance that your emails will be correctly processed. Bulk settings can be found in every email node under the Settings tab. We introduced Experiments in mid January 2018. From that moment a lot of functionality has been added. See the major changes and improvements below. Experiments Editor became simpler. Basically, you have 5 options to modify content on any web page. Change – useful for business users without any HTML knowledge. Use predefined HTML settings (colors, font definition, borders configurations). HTML – useful for advanced users who have some HTML knowledge. Add your own styles, static (text, images, web blocks) or dynamic content (customer personalization). Insert – create new content. Add prepared HTML Web block or web block with recommendations. Move – move and exchange a position on your page. Remove – remove specific content from your page. If you want to create personalized custom content for your customers (e.g. a greeting with the customer first name), you can personalize content with Jinja using HTML blocks on your website. There has always been a way to integrate product recommendations to your web page. It required implementation of advanced JS. Experiments now support adding HTML Block with recommendations that you can insert directly on your web page. Firstly, create a HTML Block, then select your recommendations. The best part is, once you define HTML block, you are able to re-use all recommendation models you desire. All of this can be accomplished without JS knowledge. Read more about benefits and capabilities of Experiments in a summary. Data API is a designation for Exponea public API. Thanks to public API, you can integrate Exponea with your systems. The Data API comes with public documentation where you can find all supported routes.